Sorry, U.S. Census Bureau, I.R.S. 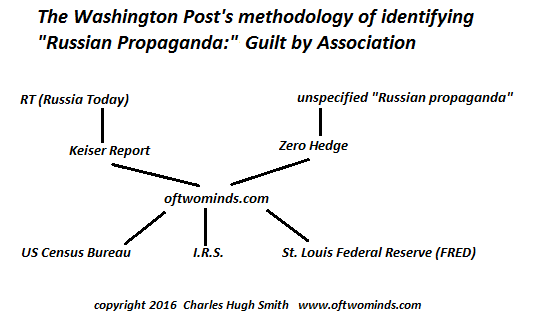 and St. Louis Federal Reserve--you're issuing "Russian propaganda" according to The Washington Post's shoddy "fake news" methodology. In case you missed it, The Washington Post's criminally careless publishing of "fake news" about purported "Russian propaganda" created a backlash--and the Post's attorney-approved bleating to sidestep responsibility for publishing "fake news" failed to calm the waters. Here's The Washington Post's "fake news" article in case you missed it: Russian propaganda effort helped spread ‘fake news’ during election, experts say. The "experts" claims of expertise were not validated or investigated by the Post, and the Post prominently linked to a list of 200 websites (oftwominds.com among them) that purportedly "wittingly or unwittingly" promoted "Russian propaganda"--but The Washington Post did zero journalistic work to investigate the list or the anonymous "experts" that published it. This criminally sloppy publishing of "fake news" isn't journalism--it's propaganda. No amount of slippery legalese can erase the fact that The Washington Post published a "fake news" story and featured it prominently on page one. You have lunch with a colleague who is an acquaintance, discuss kids' soccer and gripes about the boss, and you go home, thinking nothing of it. The secret police are waiting to arrest you. Your crime is "consorting with an "enemy of the state:" your colleague, unbeknownst to you, is considered an "enemy of the state," and by having lunch with him, you are guilty by association. This is the precise methodology of The Washington Post's shoddy "fake news" list of "Russian propaganda" websites. Any association with an "enemy of the state" site like RT (Russia Today) convicts you by association of being an "enemy of the state." Neither the "fake news" publishers of the list nor The Washington Post combed through the thousands of pages of blog posts on my site and identified those purported to be "Russian propaganda." They didn't bother, because, well, that would have taken some serious journalistic work. Just as a reminder, every major power funds international media outlets.consider BBC (U.K.); Radio Liberty (USA); France 24 (France); NHK (Japan) and China's overseas broadcast empire. It doesn't take much of a dose of cui bono (to whose benefit?) to grasp that state-owned and operated media (even if it is at arm's length to maintain a claim to "journalism") aim to paint the issuing state in rosy hues while publicizing the woes of its rivals. Even the most dimwitted mainstream media "journalist" grasps this obvious fact. The rest of us certainly do. So let's extend The Washington Post's shoddy "fake news" methodology just a bit, to the sources of oftwominds.com's "Russian propaganda." Since oftwominds.com's content relies on statistics from these three websites, clearly they are guilty by association. Here's the revised chart with another layer of "Russian propaganda" sites: the U.S. Census Bureau, the I.R.S. and St. Louis Federal Reserve (FRED). These sites are integral to oftwominds.com's output, and so by supplying oftwominds.com with anti-status quo content, they too are guilty of wittingly or unwittingly spreading "Russian propaganda." 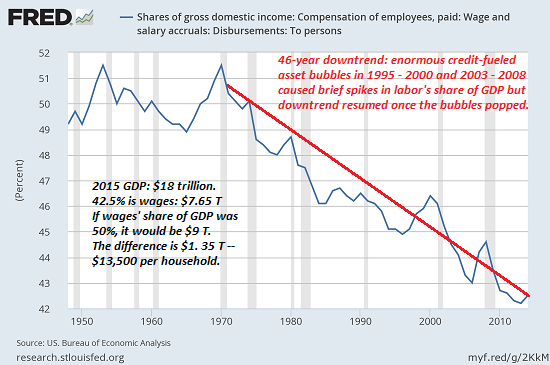 My analysis Endangered Species: The Self-Employed Middle Class relies on Bureau of Labor Statistics (BLS) and I.R.S. website data. My analysis on Why We Keep Getting Poorer: High-Cost Housing is totally dependent on data drawn from the US Census Bureau website. Sorry, U.S. Census Bureau, I.R.S. and St. Louis Federal Reserve--you're issuing "Russian propaganda" according to The Washington Post's shoddy "fake news" methodology. Your data enabled oftwominds.com and other independent journalist sites to issue content that was skeptical of official claims that are endlessly parroted by a bought-and-paid-for corporate media. You are guilty by association. So go ahead, Washington Post, extend the logic of the absurdly threadbare "methodology" of your fake-news "experts" and add the U.S. Census Bureau, I.R.S. and St. Louis Federal Reserve to the list of websites that are guilty by association of "Russian propaganda." Oh, and in case you didn't get the definition of "Russian propaganda:" it's anything that is skeptical or critical of America's ruling elite and its corporate-media shills. Remember: America's ruling elite is so wonderful and our prosperity is so fantastic that domestic dissent is impossible. Any dissent must be the work of foreign devils. And that's why we're now swimming in the raw sewage of The Washington Post's "fake news". Thank you, Paul P. ($15), for your very generous contribution to this site -- I am greatly honored by your support and readership. Thank you, Diane W. ($5), for your most generous contribution to this site -- I am greatly honored by your support and readership.